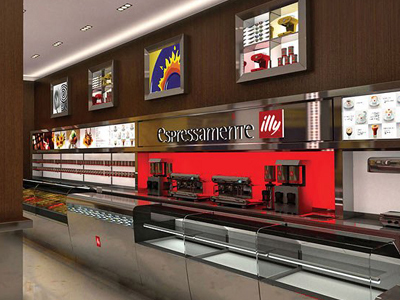 A supreme coffee beverage cannot be surpassed by Espressamente Illy in The Palazzo. Not just a café for grabbing a quick coffee, this establishment offers frappes, cappuccinos, lattes, expresso, hot chocolate and more. Add a mouth-watering pastry to the mix and you have the ultimate breakfast. Paninis, soups and salads are available for your lunchtime appetite or hold off for an afternoon snack of delicious dessert crepes, gelatos in 54 flavors, sorbets and divine chocolates. If that isn’t enough, stop by for a late night tiramisu and European cup of java. Espressamente Illy is a Ferrari when compared to the other coffee chains!